Electrochemistry of Biological Molecules presents a fairly complete summary of the electrochemistry of the more important groups of nitrogen heterocyclic molecules including purines and pyrimidines and their nucleosides and nucleotides, polynucleotides and nucleic acids, pteridines, flavins, pyrroles, porphyrins, and pyridines. Topics covered range from the theory and instrumentation of electrochemistry to various biological molecules, including pteridines, isoalloxazines, flavins, and flavin nucleotides. Comprised of nine chapters, this book begins with an overview of electrochemical techniques and their use to study biological materials, followed by a discussion on the theory and instrumentation of electrochemistry, with emphasis on their significance and utility as well aa their principles and circuits. Subsequent chapters explore nitrogen heterocyclic molecules such as purines and pyrimidines and their nucleosides and nucleotides, polynucleotides and nucleic acids, pteridines, flavins, pyrroles, porphyrins, and pyridines. The electrochemistry of biologically important pyridines is considered. 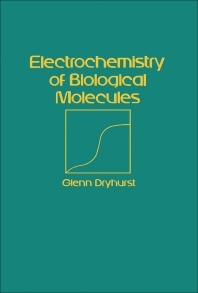 This monograph should be of value to electrochemists, biochemists, and biologists.